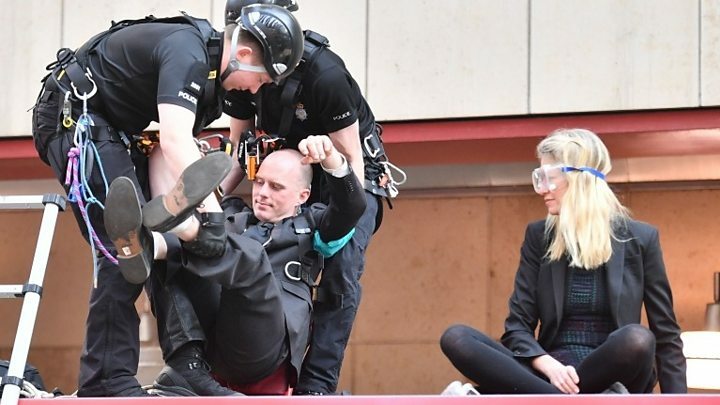 A campaigner who glued himself to the train’s window was removed about an hour after the start of the DLR protest, at about 10:50 BST. Earlier, BTP ordered Transport for London (TfL) to switch off wi-fi at Tube stations to deter protests. Campaigners at Waterloo Bridge and Oxford Circus have been ordered to restrict their protests to Marble Arch. The Met said protesters were being removed from both areas and that those who did not comply would be arrested. Jace Tyrrell, chief executive of the New West End Company, said the West End lost £12m in trade because of the first two days of protests. In Edinburgh , dozens of people were arrested earlier this week when hundreds of protesters blocked a main road. ← Xbox One with no discs: 'The way forward' or 'bad timing'?